“Let no one despise you for your youth, but set the believers an example in speech, in conduct, in love, in faith, in purity,” 1 Timothy 4:12. This bible text uplifts the young spirit of the youth to be of good example to others and not to be derided of them being young. The bible tells stories of great leaders at their young age. Genesis 37:2; 39:1-4 talks about Joseph who was 17 at that time became an overseer in the house of the captain of the guard in Egypt. First Samuel chapter 17 narrates a story of a young boy who used by the Lord when he killed Goliath the giant. Jehoash and Josiah became kings at the ages of 7 and 8 respectively and their stories can be read in 2 Kings 11:21 and 2 Chronicles 34:1 and 2. In Ruth 1:16-18 talks about a young widow who became a blessing to her mother-in-law. In Jeremiah 1:4-8, young at the age of around 17 years, God called Jeremiah to minister to the people of Judah. Another young boy Samuel was ministering to the LORD in the presence of Eli at around 12 or 13 years of age, 1 Samuel 3:3 and 10 narrates. These and other stories in the bible regarding leadership capabilities of young minds is a clear representation that God does not look into the person’s age to be able to lead. 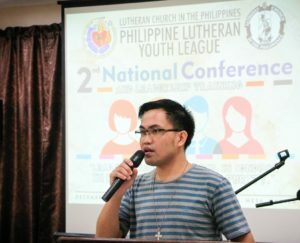 Mr. Edgar S. Toclo leading the PLYL 2nd National Conference at the Lutheran Center, Sta. Mesa, Manila on December 20, 2016. The Lutheran Church in the Philippines has been supportive of the youth organization. Two years back, the Philippine Lutheran Youth League has been officially organized with the election of the new set of officers at the Trinity Lutheran Church in Cubao, Quezon City after the church unification in 2012. The church is composed of different members, men and women, young and old. But are these members given the equal share of responsibility in the church ministry? When I say equal share, it means equal opportunity to utilize their knowledge, skills, talents, and other capabilities. It is a joy to know that the current LCP Administration is making a way for the youth to showcase their God-given talents. This was highlighted during the recently concluded national celebration of the 500 years of Lutheran Reformation in October 2017. Majority of the facilitators of the celebration belongs to the youth group who came from the different congregations in the entire country. Rev. Antonio Reyes, LCP President, once said that “the youth are the leaders of today.” It is therefore important to provide a supportive environment to allow them to exercise their full potentials because it is by letting them do their things that will make them grow. However, the responsibility of the elders should not be put aside as they have the role to guide these young minds. As the President of the Philippine Lutheran Youth League, I encourage young leaders from the local congregation to the national level not to be frightened to share their gift of leadership. We shall not be like Jonah who ran away of his responsibility, but rather, we shall be like all the young leaders in the bible who took responsibly to the call of God. Cover photo: LCP volunteer stewards lead and assist the LCP 24th General Convention and 500 Years of Lutheran Reformation Celebration last October 2017.